Chesley Fence & Deck is a leading installer of backyard decks in the Glen Carbon, Illinois area. Since our founding in 1967, we have been offering homeowners throughout the region premium decking installed by our experienced and factory-trained installers just right the first time. We also make it our mission to provide top-notch customer service, which includes helping homeowners locate the best products to enhance the beauty of their home and yard. 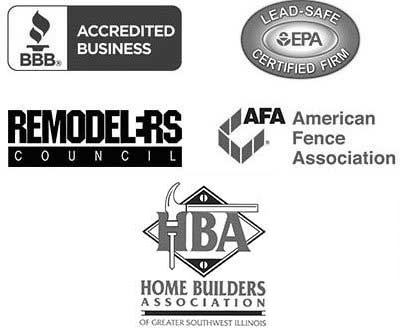 As evidence of our commitment to providing impeccable service, we even maintain an A+ rating with the Better Business Bureau. 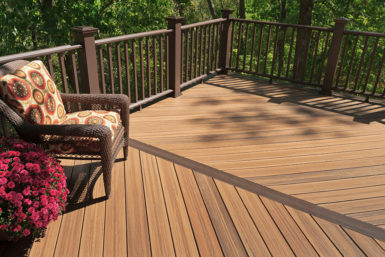 Additionally, our Tamko EverGrain® Envision® PVC coated composite decking is backed by a 20-year manufacturer warranty that covers everything from deterioration to fading and staining. No matter what decking option you choose, you can rest assured that all our backyard decks will be custom designed and built in any size or configuration you desire to suit your lifestyle needs. Contact Chesley Fence & Deck today to learn more about our incredible backyard decks available to homeowners in the Glen Carbon, IL area.